Digital Learning Training & Support (DLTS) at USF is dedicated to building the skills of USF online instructors through a variety of services. Get tools, tips and time savers to help you deliver a quality online course. Register for the Online Instructor Certification course. 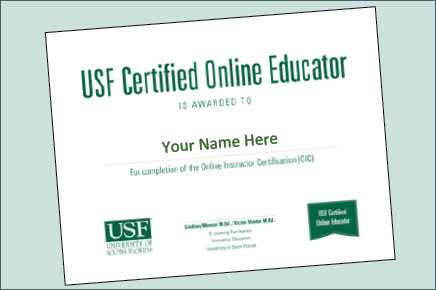 This course is required for anyone teaching online courses offered through USF Tampa Campus. Beginning spring semester 2016, USF Innovative Education will launch Proctorio, a fully automated online proctoring solution designed to help you administer online quizzes and exams. This website is maintained by Online Faculty Development.